Course, I'm blogging about it because using their little widget can be a helpful exercise for a clayer. As you play with it, consider how the changes in the position of the eyes, eyebrows, nose, and mouth affect the character of the figure. Think about how you might make some of the features in polymer clay. 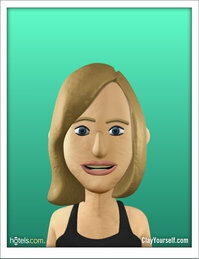 If you're feeling ambitious, recreate your avatar using polymer clay. Then use the widget to make 5 other interesting characters (try the "randomize" feature), and recreate those in clay, too. A creative exercise making claymation-style faces in polymer clay.